Over 80 million Americans went without medical coverage at some point last year. The sorry state of for-profit health care in the United States is well known: while more money is spent per person than anywhere in the world, the quality of care and access to treatment lags far behind nations with single-payer, socialized systems. The United States’ infant mortality rate is the highest in industrial world (a figure which is multiplied three times in the African-American community.) It would be fair to call the disaster of private health insurance “The worst that money can buy” – for patients. Insurance and drug companies, of course, aren’t complaining: health care costs are rising at nearly 10% every year, providing plenty of incentive for them to defend the system which puts insurers and pharmaceutical corporations first. Read the first draft of a report on Obama’s first 100 days. When Obama became president, it was not clear what the politics of health care reform were going to be. Would he try to get a plan of his own accepted by Congress? Or would he instead stand back allowing Congress to work out a plan for him to sign? Had Obama introduced and lobbied for a plan, the momentum would have made a big difference in the content of the plan Congress would ultimately vote on. Instead, he left the task of formulating a plan to the Senate Finance Committee, chaired by Max Baucus. In testimony and hearings before that committee, the insurers and their allies have had many opportunities to leave their mark on the bill that goes to the Congress. So Obama deferred to the insurers, who have effectively taken over health care reform. Rather than agree to health care reform that would weaken them, of course, the insurers see an opportunity to use it to become stronger. They don’t want more regulation, and they don’t want fewer clients. In league with hospitals, the American Medical Association, and drug companies, insurers have gone directly to the president to assure him that the health care industry can regulate itself. The industry promises to save $1.7 trillion over a ten year period, which would slow inflation in health care costs only 1.5% a year. In all likelihood, each of the groups in the industry will look to the others to take the burden of cost-cutting. The insurers expect the government to expand their business by subsidization of insurance for the families of the 47 million uninsured. Employees who receive health care from their employers would not have to change their insurance, which even with a reform would continue to hamper negotiations over wages. Paying for the subsidies, amounting to $120 billion a year, would be the largest burden of health care reform of the sort that Obama and Baucus want. The question is how to raise the money. Obama the candidate said he would pay for it by not renewing the Bush tax cut for the rich. But, now, the Baucus committee leans toward capping the break employees get from tax- free employer contributions to their health insurance. The insurers are less interested in where the money comes from than in making sure they get it. After all, they hope to recover from the current financial crisis, which hit many of them who had bundled their premiums to sub-prime mortgage trading. The Massachusetts health reform law, Chapter 58, which went into effect in 2006, is a basic model for proposals to subsidize insurance for the low income uninsured. Chapter 58 calls for an insurance exchange linking people to six insurers each offering four levels of coverage. Everyone must have insurance or else pay a penalty. For those above the subsidy level, affordability remains an issue. If they can prove insurance is unaffordable, they can escape the penalty. There are no exclusions for pre-existing conditions. The major difficulty with this plan is that it has no means of containing costs. Health care costs rose 23% during the plan’s first two years. To pay for the reform, the state is reducing funds for health facilities for those who cannot afford the premiums. In the plan that Obama proposed while a candidate, there was no mandate to buy insurance. Another point of difference with the Massachusetts plan was Obama’s inclusion of a public insurer along with private insurers in his version of an insurance exchange. The private insurers love the mandate since it means more business, but they hate the public plan for its potential to provide quality policies at lower premiums. The influence of the insurers on the Baucus committee leads one to believe that any bill it drafts will have some form of mandate to buy insurance and either no public plan or one so restricted that it would be no more attractive than any private plan. It is difficult to imagine how any version of a plan to subsidize the purchase of insurance to lower income people can successfully rein in costs. But unless it reins in costs, universal coverage will rapidly become unaffordable. A sure way to rein in costs is to pay providers less. Why don’t insurers do this? An insurer who pays less for the delivery of health care by doctors, hospitals, or clinics will find that those providers will cut corners on giving care to and discourage patronage by patients with that insurer. The insurer will lose members and, even worse, will lose investors. Despite the hopes of the Obama-Baucus reformers, it is unrealistic to think that regulations on insurers will last. Putting limits on premium increases will last only until the insurers return to Washington begging for relief from such limits on the ground that on Wall Street investors are fleeing to more profitable industries. An alternative being advocated by healthcare advocates around the country is a single-payer healthcare system. Under a single-payer system, health insurance would be socialized; the government would pay for care that would be delivered in mostly in the private sector. This is similar to how Medicare works in the US; many European countries, Canada, and Japan have national single-payer healthcare systems. A single-payer system is different from the current multi-payer system in that a single-payer system would replace for-profit, private insurance companies with health insurance provided by the government. The reform proposals being considered by Congressional Democrats maintain and even expand the role of insurance companies, since currently uninsured individuals would be required to obtain insurance from private providers. The great advantage of a single payer system is that it avoids the built-in inflationary push of the commercial insurers. Cost containment does not have to rely on regulating those insurers since a single payer can control medical costs through negotiations by a public agency with physicians, hospitals, and pharmaceuticals. The remaining inflationary tendencies in health care are then not those of the insurers but are a reflection of the inflation outside the health sector coming from profit making firms. The past few months have shown that activism on behalf of a single payer reform has cast doubt on the view that single payer is politically unrealistic. This view was always self-serving. Baucus holds it since he does not want the steady stream of funds from the health industry to his political campaigns to dry up. The major labor union SEIU holds this view because it wants government help in acquiring union contracts. When Baucus threw single payer advocates out of two of his meetings, he only brought the advantages of single payer to the public’s attention. It is never too late to talk to various kinds of groups about getting single payer. But at this point, street actions in many cities involving large numbers are helping raise awareness of the issues at stake. It is no longer just the polls but also activism that is making people aware that a majority want single payer. For that reason alone it must be on the table. Make the local offices of congresspeople and the offices of the major private insurers feel the heat! Union locals and central labor bodies can confront the leaders of their international unions on why they hesitate to support John Conyers’ HR676. 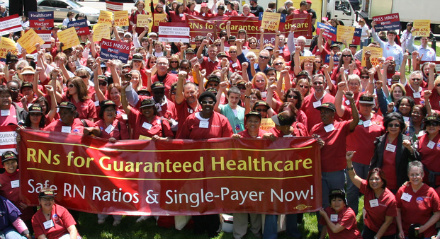 We should support all mobilizations by Labor Campaign for Single Payer, Health Care Now, Single Payer Action, and state coalitions for single payer.